Thibault Carron’s And if fashion was… puts 18th century fashion in the modern world #celebratephotography « Adafruit Industries – Makers, hackers, artists, designers and engineers! 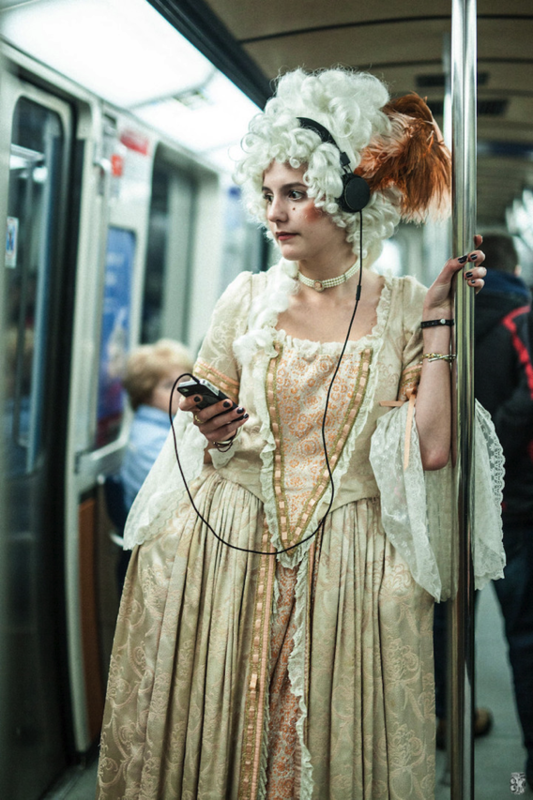 Photographer Thibault Carron imagines what modern life would be like if our fashion was from the 18th century. In his playful series And If Fashion Was…, the Montreal-based creative juxtaposes scenes from contemporary culture with a woman whose outfit and hairstyle recall a time from centuries past. Wearing a tall and curly-haired white wig in addition to an elaborate grown with a circle skirt, corseted waist, and Rococo patterning on the textiles, Carron’s subject goes about daily life as if there’s nothing unusual about her choice in style. She uses modern technology—listening to music while on the subway, playing video games, and rocking out on the electric guitar—without the slightest hint of discomfort or embarrassment. This character is also seen chowing down on modern cuisine—a fast food burger and fries—with the same stoic expression, making it all the more comical.